Greetings everyone, this is Nate Jones. This summer I have been fortunate enough to be part of the BIObus crew for my first time. I have a keen interest for nature and all things wild. 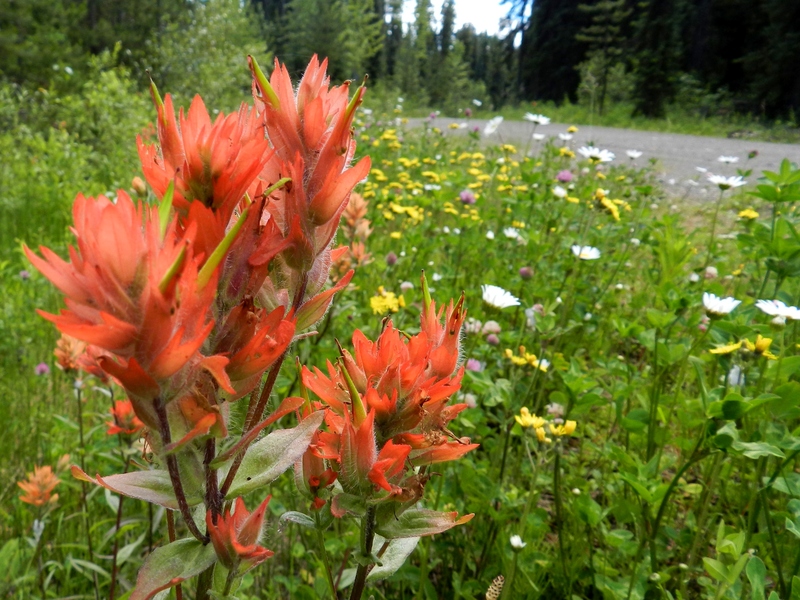 I am feeling very comfortable, here in Northern British Columbia, where there is no shortage of wildlife and boasts a vast array of plant life. I feel like I am right in my element and I am eager to learn about the native flora and fauna. 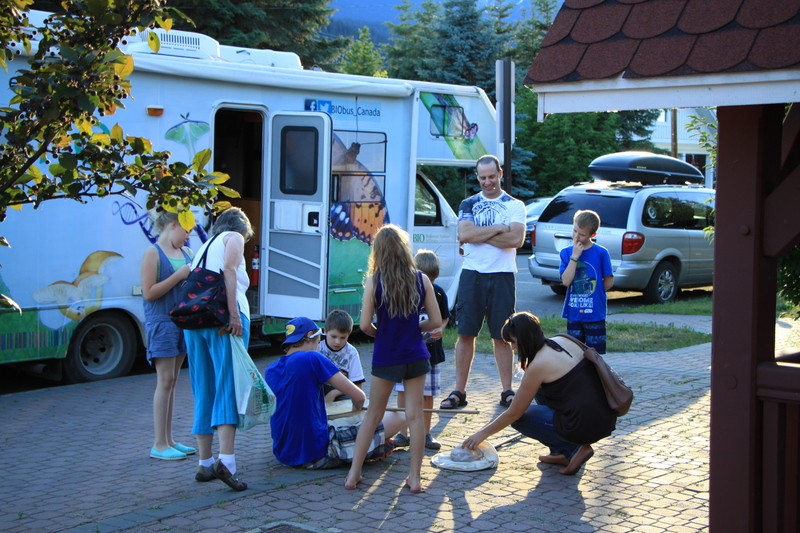 So far my experience on the BIObus has been nothing but positive, from meeting the local people living in the community of Smithers, to the set up and servicing of our insects traps. I have been sleeping outside in my hammock every night and I am hoping to spend the rest of the summer sleeping outside. I also have really enjoyed general collecting, where we are collecting away from our standardized insects traps. 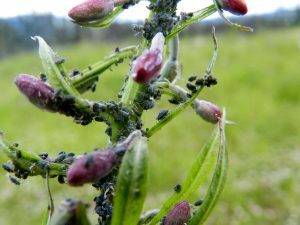 This gives me a great opportunity to apply what I have learned in the class room, by exploring different micro habitats to find a variety of insects. My crew is also great. They all have a keen interest with insects and the surrounding wildlife, so we always have a lot to talk about. I am already feeling accustom to our weekly tasks, and am feeling like I am right in the swing of things from sweeping with nets, nights sheets, bucket traps, aquatic sampling, and of course our standardized sampling. The only complaint that I can really say is the tough time I seem to be having with the lock on the door of our RV, but luckily I am not alone with this difficultly, but it is far from serious. 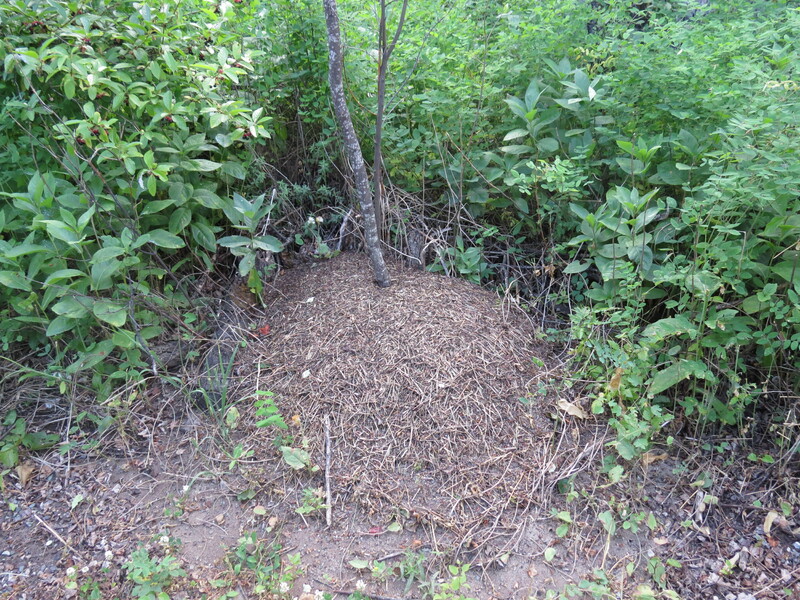 The giant ant mounds that cover the entire campground where we are staying at, Tyhee Lake Provincial Park. So far the wildlife aside from insects has been limited but I am sure I will be seeing more, my crew has been assuring me that we will. 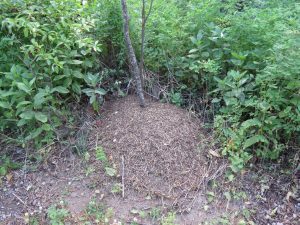 I was fascinated by the giant ant mounds that cover the entire camp ground where we are staying at, Tyhee Lake Provincial Park. The ants have highways all over the park and if you happen to stop walking on top of one you will have ants in your pants literally! In all respect they were not a nuisance at all. I was also very happy with the catch of a humming bird moth that we caught during one of our general collection days, probably my favorite catch of the trip thus far. I have also seen the largest velvet mite I have ever laid my eyes on, it was about 3-4 mm which I think is large for a velvet mite. I was pleasantly surprised to get to see a fish. I really enjoy identifying fish, and even took a course last summer getting my level one fish identification certification, and was happy to get to apply some of what I learned from that course. 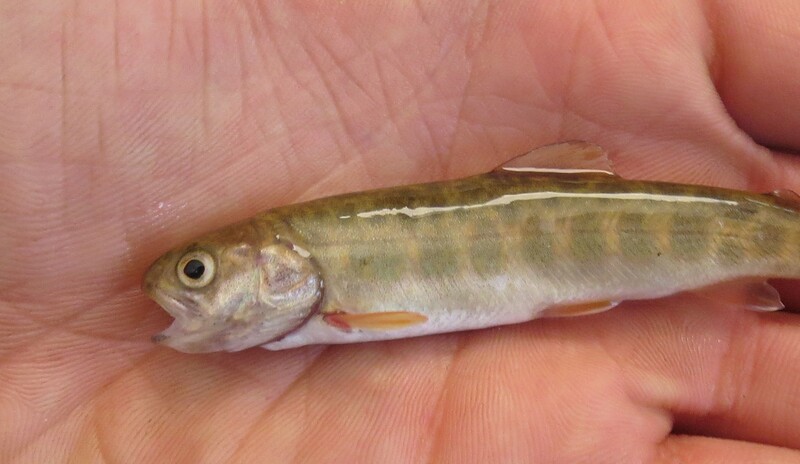 Being a juvenile in the Salmonidae family, makes the identification tricky, but I have narrowed it down to either a brook trout or a rainbow trout. I am leaning more towards a brook trout but I am waiting for a second opinion from one of my friends that is great with fish identification as well. I can mention something about this in my next post when I am sure. I have also been really enjoying the time I have been spending in my off time meeting people down at the beach at our campground. I have easily met over 40 people from all age groups. It was very pleasant that every single person was interested to hear what I had to talk about, and they were more than happy to get some insect buttons, bookmarks and magnets as a souvenirs. 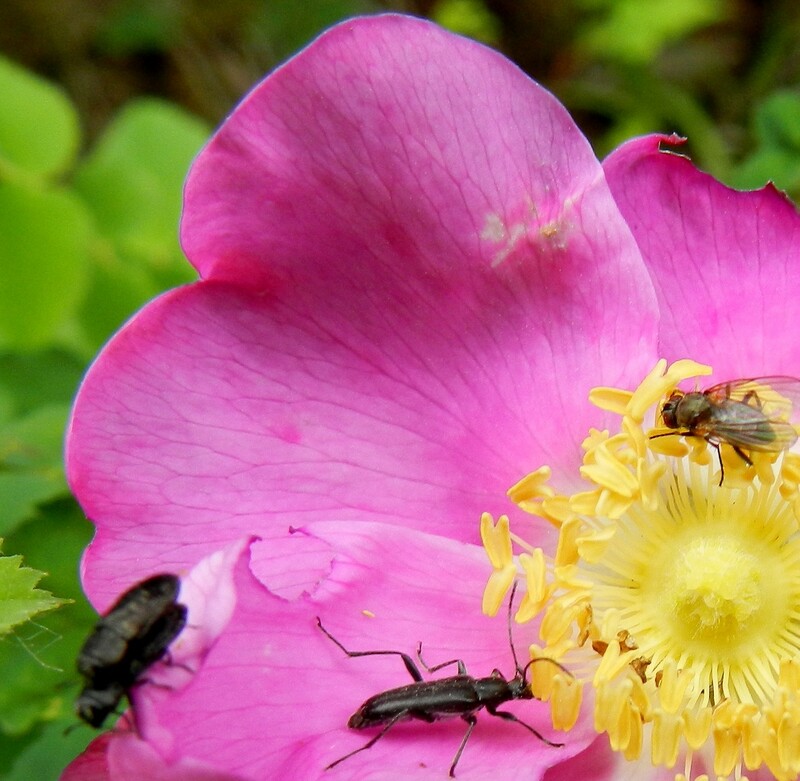 Everyone seemed to have there own story of insect encounters which helped me get an idea of the local wildlife. However some wanted me to identify what they had encountered, by description only. I tried my best, but it can be hard when someone is describing what they have seen days or weeks ago. We also had a great turn out for our educational outreach program at the beach. People really enjoyed the see the local butterflies that we had caught and displayed. I really enjoyed showing some young children how to sweep net and explain some of the different traps we had on display. There were always some super enthusiastic kids that made it really fun to interact with. At this rate we may run out of buttons and other free swag if our outreach programs and my constant interactions with whoever is up for listening continues. We also made some great friends with the local Rangers who we owe a great thanks to. They were kind enough to not only help us select our sampling sites across 3 different habitats, but also drove us to our locations with our traps and gear as the RV could not make it down the rugged logging roads, saving us hours of time. Aspirating some insects that kids were catching at our second educational outreach and presentation at the Old Church in Smithers. We were also fortunate to have had a second outreach opportunity at an old restored church in the town of Smithers. I had a great time hanging out with a big group of kids who were intrigued with bugs once I started to show them how to sweep net and aspirate the insects out of the net. They all ended up going home with baggies of insects that they had collected themselves and seemed to want to start their own collections and explore what is around there homes. All and all it was a great first week to start off a great trip. I can’t wait to discover what lies on the road ahead.